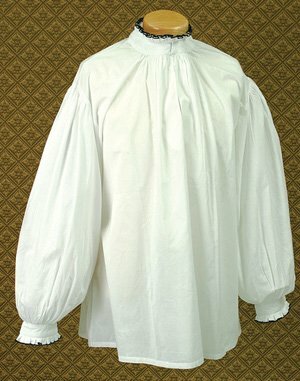 Henry VIII Courtly Shirt from The Tudors - Small to Medium - is a closeout item at a terrific price!! Henry VIII Courtly Shirt from The Tudors - XL - is a closeout item at a terrific price!! From our King Henry Courtly Ensemble is this lovely bright white period shirt with a black edged Tudor collar. Hook & eye closure on collar. 100% cotton.